At the 2013 annual International Society for Extracellular Vesicles (ISEV) (http://www.isevmeeting.org/) conference held in Boston, April 17-20, Michiel Pegtel, Ph.D., Immunologist in the Pathology Department at the VU University Medical Center in Amsterdam, The Netherlands, gave an oral presentation describing how comprehensive deep sequencing analysis revealed non-random small RNA incorporation into tumor exosomes and discussed the biomarker potential of these results. 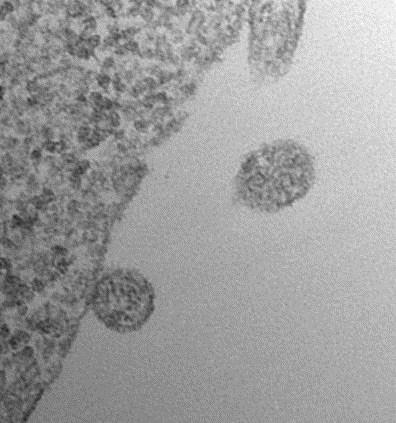 Exosomes (image) are tiny subcellular membrane-bound vesicles (30-150 nm in diameter) that are released by a wide variety of normal cell types and cancer cells, and that can carry membrane and cellular proteins, as well as microRNA (miRNA), and various other types of RNA, including mRNA fragments, representative of the cell of origin. It is thought that exosomes may serve the purpose of shuttling information from one cell to another. For instance, it has been shown that exosomes can carry material from cancer cells that acts to suppress the immune system and stimulate angiogenesis, thus encouraging cancer growth. In talking with BioQuick, Dr. Pegtel emphasized the key role of deep sequencing in his work. “In contrast to closed profiling technologies such as microarray and RT-PCR arrays, deep sequencing has literallyy opened our eyes on the complexity of the human transcriptome. Our previous work using individual quantitative RT-PCR could demonstrate that human B cells infected with the tumor virus Epstein Barr (EBV) secrete exosomes that contain fully mature and functional virus-encoded miRNAs. At the ISEV meeting, Nobel laureate Dr. Phillip Sharp stressed the importance of quantitation in RNA research. I could not agree more as this applies directly to research concerning transfer of functional RNA via exosomes. At the 2013 annual International Society for Extracellular Vesicles (ISEV) (http://www.isevmeeting.org/) conference held in Boston, April 17-20, Andrew Hill, Ph.D., Professor in the Department of Biochemistry and Molecular Biology, at the Bio21 Institute, University of Melbourne in Australia, delivered an oral presentation entitled “Infectious Prions Are Associated with Morphologically Distinct Exosomes.” Exosomes (image) are tiny subcellular membrane-bound vesicles (30-150 nm in diameter) that are released by a wide variety of normal cell types and cancer cells, and that can carry membrane and cellular proteins, as well as microRNA (miRNA), and various other types of RNA, including mRNA fragments, representative of the cell of origin. It is thought that exosomes may serve the purpose of shuttling information from one cell to another. For instance, it has been shown that exosomes can carry material from cancer cells that acts to suppress the immune system and stimulate angiogenesis, thus encouraging cancer growth. In his presentation, Dr. Hill first showed evidence that PrPC (non-infectious) and PrPSc (infectious) forms of the prion protein are both associated with exosomes. He also demonstrated using cryo-electron microscopy that prion-infected cells release exosomes with distinct ultrastructural features and that prion-containing exosomes are more effective at transmitting prion infection than are cell extracts. Dr. Hill also showed that small RNA deep sequencing revealed a distinct miRNA profile in exosomes from prion-infected cells. This sequencing was carried out using the SOLiD® platform and also the Ion Torrent™ platform from Life Technologies. This analysis showed nine miRNAs to be dysregulated in the exosomes from prion-infected cells versus miRNAs in the exosomes from controls. Based on these results, Dr.
Memory was improved in mice injected with a small, drug-like molecule discovered by University of California-San Francisco (UCSF) researchers studying how cells respond to biological stress. The same biochemical pathway the molecule acts on might one day be targeted in humans to improve memory, according to the senior author of the study, Peter Walter, Ph.D., UCSF professor of biochemistry and biophysics and a Howard Hughes Investigator. The discovery of the molecule and the results of the subsequent memory tests in mice were published in eLife, an online scientific open-access journal, on May 28, 2013. In one memory test included in the study, normal mice were able to relocate a submerged platform about three times faster after receiving injections of the potent chemical than mice that received sham injections. The mice that received the chemical also better remembered cues associated with unpleasant stimuli – the sort of fear conditioning that could help a mouse avoid being preyed upon. Notably, the findings suggest that despite what would seem to be the importance of having the best biochemical mechanisms to maximize the power of memory, evolution does not seem to have provided them, Dr. Walter said. "It appears that the process of evolution has not optimized memory consolidation; otherwise I don't think we could have improved upon it the way we did in our study with normal, healthy mice," Dr. Walter said. The memory-boosting chemical was singled out from among 100,000 chemicals screened at the Small Molecule Discovery Center at UCSF for their potential to perturb a protective biochemical pathway within cells that is activated when cells are unable to keep up with the need to fold proteins into their working forms. In a piece of work carried out by the Carbohydrate Metabolism Research Team of the Institute of Agrobiotechnology (a center jointly owned by the NUP/UPNA-Public University of Navarre, the Spanish National Scientific Research Council-CSIC, and the Government of Navarre), the discovery has been made of the way in which the glgS gene (now renamed as the “surface composition regulator”, scoR) acts in bacteria and how the mechanisms involved in bacterial infection can be altered by manipulating this gene, which indirectly affects glycogen production. The finding has been protected through the application for a patent and the exploiting of it is now pending a response from institutions or companies prepared to develop it. Thanks to this discovery, the researchers received the top prize in the 9th International Medical Congress in the category of “Genetics and Molecular Biology” held in Warsaw recently. As Dr. Javier Pozueta, director of the Carbohydrate Metabolism Research Team that carried out the work, explained, "We can say that we may have found an additional way of combating bacterial infections and contamination by encouraging the formation of glycogen in bacteria. Now we know that by altering the glycogen-producing machinery, we can in turn alter the capacity of the bacteria to move, stick to a cell or to the surfaces of tubes, catheters, etc.” The 9th International Medical Congress held in Warsaw from 9 to 12 May, 2013, drew 1,400 researchers from all over the world and 700 pieces of work were presented. The researcher Dr. Mehdi Rahimpour attended on behalf of the research team of the Institute of Agrobiotechnology (IdAB). Together with Dr Manuel Montero, he was the main architect of the winning piece of research. The research was published online on March 28, 2013 in the Biochemical Journal and is based on the Ph.D.